They are both pretty much the same. I read it to my class last year in hopes we would all become bucket fillers which is complimenting others and doing kind things for one in another to make them feel good (have a full bucket). It caught on for a few weeks. We wrote positive notes to each other right after we read the book. 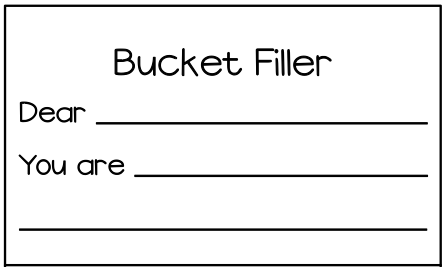 Then it was over.. after a few more months our class was no longer bucket fillers and the kiddos probably didn't really remember what it was all about. I wanted that to change this year. I wanted it to be continuous and really embrace complimenting others and writing positive notes to each other. Maybe it is because I LOVE positive notes and specific positive feedback but then again who doesn't?!? In order to make this really catch on I devoted my door to bucket filling. Every time students walk in and out of the class they are reminded of our buckets. 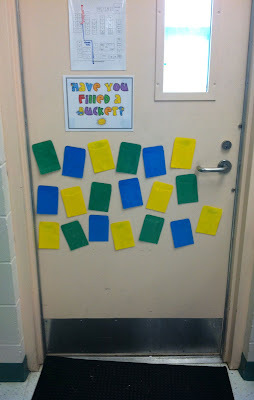 Our bucket fillers are located right next to our door which are little slips of paper student's write on to one another. I don't know where I got the heading sign. I printed it our before my first year teaching and laminated and then never used it. I found it as I was prepping my room this year and thought it would work! I made my own set of headers to use but just never got around to printing/laminating them all. 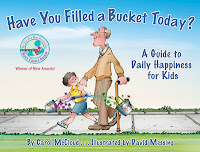 So last week I read my students How Full is Your Bucket?, it took towards the end of the book for some of my boys to really catch on. Afterwards I modeled complimenting students and they complimented me. Then they raised their hands to begin complimenting each other. They caught on pretty quick... After I showed them our 'buckets' on the door and the slips of paper they can use. 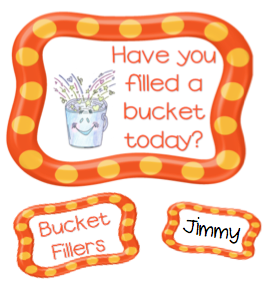 They then wrote on the slips and filled others buckets. That is when it came full circle and they really got it. 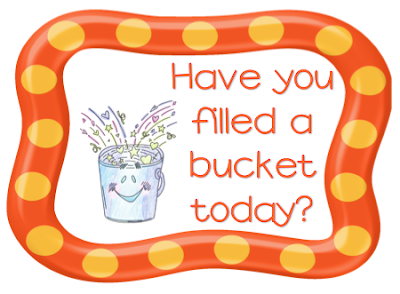 Since last week, my students have been wanting to fill buckets nonstop. I do read most of the notes when my students are at specials to make sure it is appropriate and doesn't turn into 'Will you be my girlfriend?' or something like that. 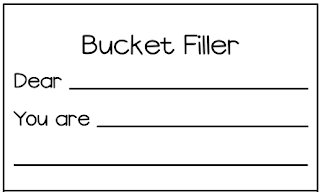 Using the Bucket Filler sheets though forces students to write something positive so I don't think I should encounter any issues. Students check their buckets as they walk out of the door to go home and it is so funny to watch them read their notes as they walk out and smile so big. I love having them read them as they leave school so they have something positive to tell their families. 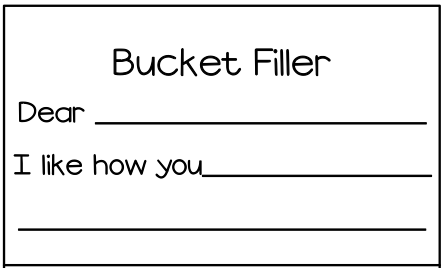 Also I LOVE filling my students buckets. Those students who aren't as 'popular' (hate using that term) and don't receive as many notes I help them out a little bit. 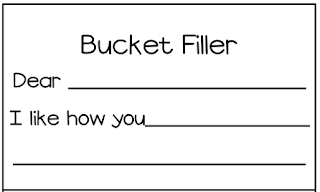 Whenever I see my students doing something really good or improving I grab a bucket filler slip, write a quick note, and put it in. This way hopefully they will continue to show that behavior continuously! It also is a definite relationship boost with my students. I've never gotten so many positive notes from students in one week! They LOVE filling my bucket too. Overall you can tell the positive energy is like radiating from my room. 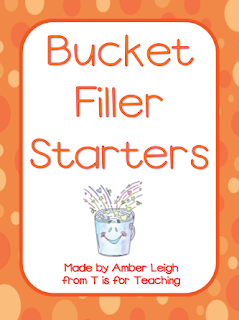 It will keep it fresh and students will use a new bucket filler starter each month. To download your bucket filler starters click here. This has been one of my favorite things I've implemented this year and I can't wait to use it all year long! Do you tie this into your classroom? Have you heard of this book? ps. Go USF Bulls! So excited college football is back! I found this book over the summer and plan on using it this year. 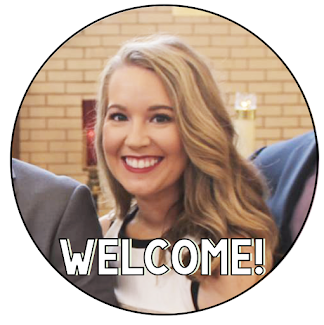 I just found your blog and am your newest follower! What did you use to make the pockets? I just used library pockets you can find at any teacher store. You can see them on the door. I put students names on them after the picture was taken. I've read the book, and just like you we filled each others buckets the first week and then no more. When do you let them write notes? I had a problem where they were writing notes and getting our of their seats all day long. Also, what do you use for the personal buckets? I let them write notes in the mornings as an optional bell work. When they come in they can fill someones bucket, go book shopping, take an RP test, or read. Oh and I use the library pockets you see in the 3rd picture on the post. Each pocket had a students name on it. They were attached to the door with painters tape. But what about all the reported sightings? Believers gucci replica make the point that people from all age groups, socioeconomic backgrounds and education levels say they've seen the creatures, indicating that the sightings are not an isolated phenomenon limited to a few pranksters replica belts and kooks. Skeptics counter that while these people aren't necessarily lying about what they've seen, they may be mistaken. A bear in the wild will stand up on its hind legs, possibly giving the impression prada replica of a tall primate. Impressions are highly subjective, skeptics note, and may be skewed when a person has heard a bunch chanel outlet of stories about a strange creature in the woods. That was an amazing post. I was in your shoes once, and use to counter these issue with productive planning. And after years of dedication to this field, i used my experience to get myself an Online Life Experience Degree which helped me gain new skills and expertize. Rain shook his head did not speak, ray ban sunglasses sale online cheap also ray ban sunglasses sale uk said rain, day today. ray ban sunglasses sale uk not speak in front. You how the rain. ray bans sale uk online Face so ugly, is sick of it. Dumbo students scared panicked, very gentle rain touched the forehead, ray ban sunglasses sale uk Rain, tomorrow ray ban sunglasses sale uk a holiday, where we go to play ah. cheap happy face and asked, but the girl did but not hot. Reading and writing is a great hobby if you believe also it is not very difficult to do. I understand peopple ahve problem in grammar mostly so they can use paraphrasing website online for paraphrasing and rewording the sentences.